Only in Japan: taking a Hello Kitty-themed bullet train (shinkansen) where one carriage is entirely pink and the restaurant car has a life-sized Kitty for photo opportunities. We take this train from Kyoto to Hiroshima to skip some of Japan’s most build-up areas where riding is less fun. We skip to the West. From Hiroshima, we’ll slowly island-hop and cycle Eastwards again towards, eventually, Tokyo. After the usual packing up the bike, hauling it through Kyoto station (which is BIG) and getting it through the gates onto the platform, we wait to board the train which is already here. Doors closed, dozens of people are taking selfies with the white and pink train. 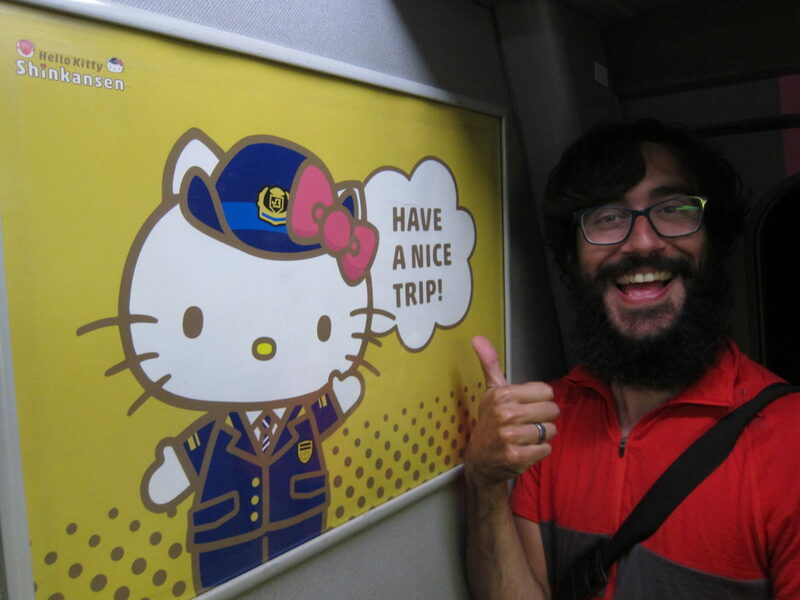 Even in Japan, a Hello Kitty train is unusual. We don’t take many photos because the SD card of our camera is full, and every new photo means deleting an old one until we can get our hands on a pc to transfer them online. 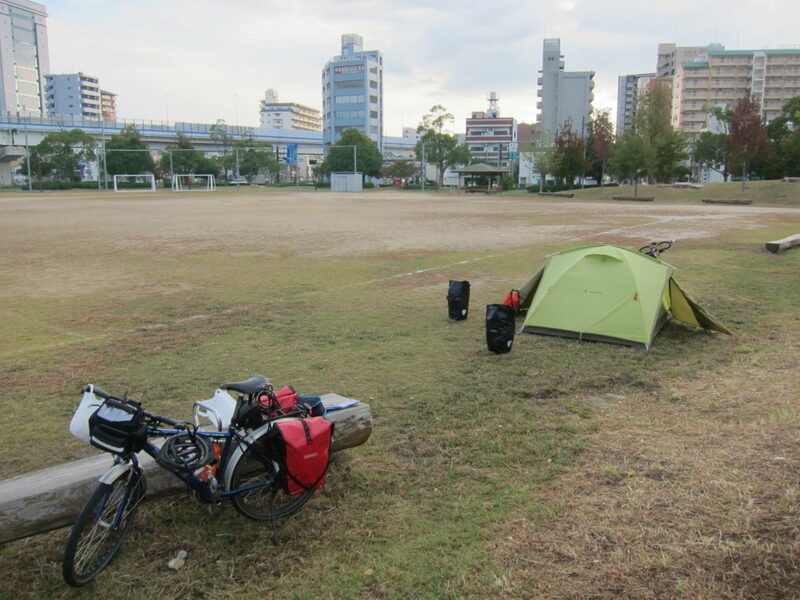 A few hours later we do the gate-passing, station-hauling, bike-unpacking and assembling in reverse, in Hiroshima, our Westernmost point of the trip. First mission: food (as always). We are in the heartland of Okonomiyaki now, a pancake filled with shredded cabbage, pork and topped with mayonnaise and a sweet sauce. 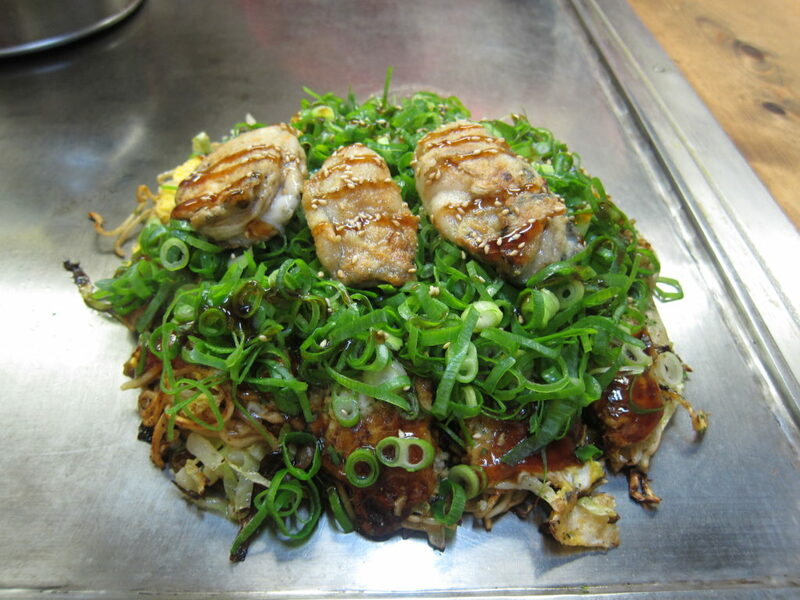 Hiroshima-style okonomiyaki is slightly different, and of course we must try. Here the batter is not mixed with the filling but everything is piled on top of the pancake and then fried, including mushrooms for me and oysters for Antonio. Mission two: locate the Hiroshima Dome and the atomic bomb monument. We ride through the city, which isn’t particularly interesting. We don’t really have time to look around because it is late afternoon already and would like to see the dome during daylight. It’s always a bit weird when a town’s main attraction is a testament of a gruesome history, but Hiroshima has turned it around as a tribute to world peace. The dome is impressive: the only old building standing like a skeleton between all post-war construction. The only one that survived. The park next to it, ground zero, houses several monuments to commemorate the dead, the children, the tributes to peace and most of all the thought: Never again. Never again. I truly hope the world will be that lucky. When it is dark we set out to find a campsite, which is not easy in a city the size of Hiroshima, but it is Japan so it is not impossible either. On the map we spot a park close to the port where we will take the ferry the next morning, and gamble on sleeping there. When we arrive it is a wide open grassy space, surrounded by a highway, a tram, the port and roads. But…there is also a toilet building and some gazebos and a small mount behind which we pitch our tent. We sleep quietly, even though we hear people walking their dogs just on the other side of the mount. When we wake up the next morning we see that we are pitched right on the side of the football field, right next to the white line chalked on the grass. Nobody is playing though, so we pack up and make our breakfast on a bench. Suddenly Antonio bends down and picks something up from the mud next to the bench. Between his fingers he holds an SD card. Brushing of the sand, we stick it in our camera (what could possibly go wrong?). There are no images on it but it is full – used for other storage I guess. What a lucky find. Antonio finds always nice things like this: a water bottle holder, a reflective strip of Velcro, money, bottled drinks, a foldable seating mat…but this is by far the most useful find yet. We roll our bike 200m to the port, buy tickets for the ferry to Etajima, and roll on board. Note: We are back in The Netherlands for a little over a month now, safe and sound. Happy New Year! I will slowly keep adding blog posts to cover the rest of the trip, but writing about everything is considerably harder (and somehow also easier) when you’re not in the middle of it. Stay tuned!